Happy Wednesday! It’s day three of our #HolidayAppetizers week. I’ll be sharing a recipe a day of my favourite party foods. 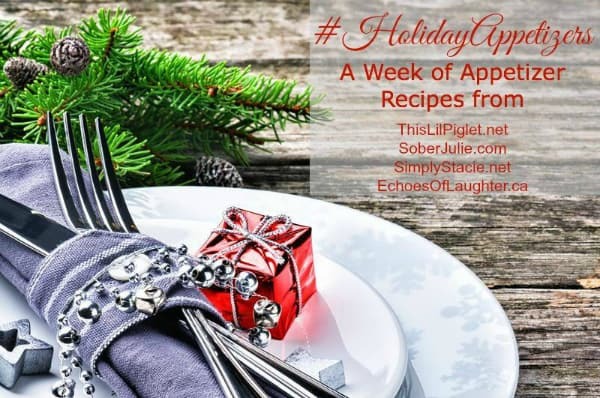 Three other bloggers are also doing the same thing so by the end of the week, you’ll have 20 new appetizer recipes to try. If you and your guests like hot, spicy foods, this is a great recipe to try. 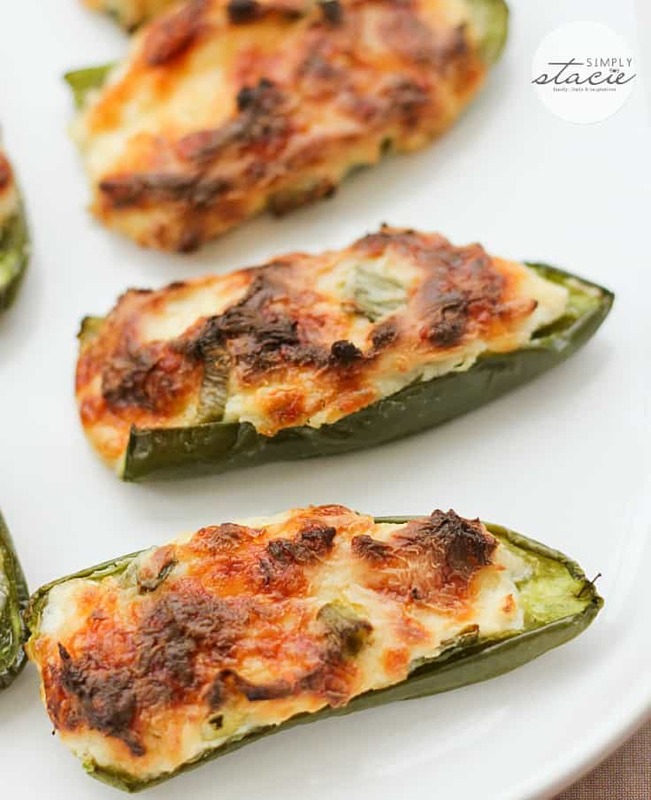 We love jalapenos and these Cheese Stuffed Jalapenos will light up your tastebuds. Warning…have some water near by! They are stuffed with a creamy, cheesy filling with a little cumin and green pepper. I used my extra cream cheese filling on bagels. After you’re done handling the jalapenos, make sure to thoroughly wash your ends. If you touch your eye and still have some leftover on your skin, it will burn your eyes. I’ve done that before and trust me, I’m very conscious about it now. Lesson learned! To find more appetizer recipes, head over to my friends’ blogs! Preheat oven to 425°F. Grease a baking sheet and set aside. Slice each jalapeno lengthwise and scoop out the seeds and ribs with a spoon. In a bowl, mix together cream cheese, Monterey Jack cheese, cumin and green onion. Add a spoonful of cheese mixture to fill each jalapeno. You will have to spread out the cheese a little so it covers the inside of the jalapeno. Bake for 25 minutes or until cheese is browned and peppers are soft. Enjoy hot! Makes 24 individual appetizers. Thanks for the recipe. My dad was telling me about these stuffed peppers he had at my uncles house. I think I will try to make these and see what he thinks. They look good! mmmm cheesy jalapenos are so good! I’ve never made these before, and in looking for good recipe to make, this is sooo cool – it is “guy” friendly, which is good for some of these gatherings – I want my contribution to be chatted up – and I think this will do it!!! I can’t wait to make this – thx for the tip about being careful. 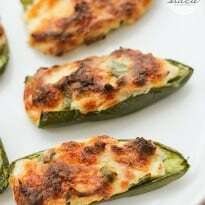 I like spicy food and these cheese stuffed jalapenos are sure to spice up any menu. Thank you for sharing this recipe. This recipe sounds wonderful, I will be making these this weekend. Thank you for this recipe. I find jalapenos too spicy on their own, but when you combine them with cheese, they’re fantastic! Excellent combination, I want to make this! I love love love stuffed jalapenos. How can you go wrong…spicy bite of pepper plus the rich, creaminess of cheese. They are wonderful in many ways. We’ve all been there with the lesson learned…several times. My daughter makes them in a couple of ways. One of the ways we enjoy is with Swiss cheese; it will be interesting to try it with Monterey Jack. These look like great party food! I’d love to try making them! These are surprisingly easy! I always thought it would be difficult but I guess when they aren’t breaded it is easier and healthier! These look delicious. I wonder if they would be mild enough for the kids. If I make these, I’ll never have to buy poppers again! These look so good! This is in my category of must make. 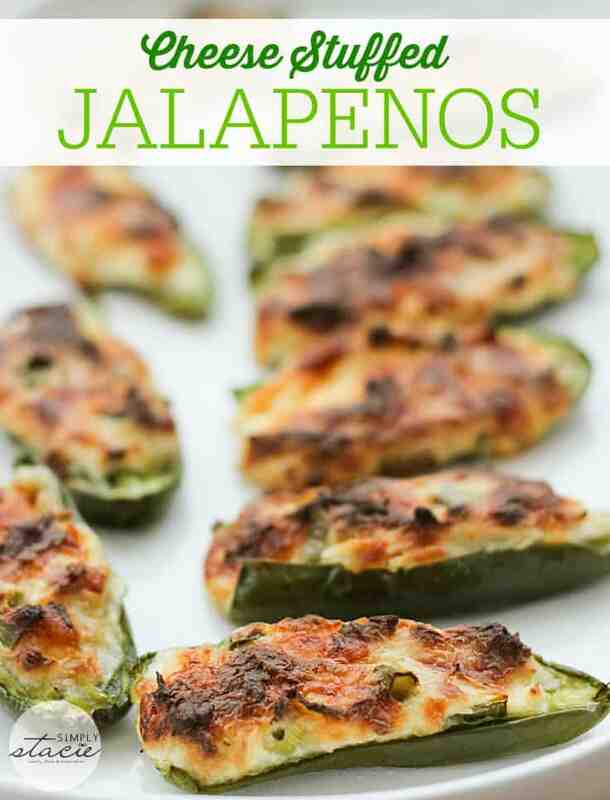 My husband LOVES these things and he always orders them whenever he sees them on the menu – with various levels of satisfaction (not all Cheese-Stuffed Jalapenos are created equal!) but in any and all cases my Honey/Hubby could easily eat two order all by himself – which makes them quite expensive! Your yummy sounding and easy to make recipe not only brings the price and accessability (anytime!) back down to earth – but it also means I can control the HEAT (lower it at least in some batches) so that myself and few other low-heat-tolerant-to-the-tongue folks can enjoy them too. Thanks Stacie & Merry Christmas! My husband would love it if I made these for him. Me and my husband love jalepeno peppers. These look great. Thank you for this recipe these are so yummy!! These look great!! Thanks for sharing!! I LOVE stuffed jalapenos and these look way too good to pass up! Pinning and stumbling. I found you on Fluster Buster. Thanks for sharing! Oh, I love the color of the browned cheese! Great appetizer, Stacie. Thanks for sharing! Thanks for the recipe; looking for something to take to a New Years eve party. Must try we love them but I’ve never tried cumin in recipe.